This collection of four fifteen- minute icompositions for drums and voice will not blow out your speakers. McGrath's drumming is almost intimate, with an integrated sound so you feel close to the palm and the drumhead and the body. The pieces sometimes slither, they unfold and unwind, they build and they layer. Their primitive trancelike qualty is almost ceremonial, and the women's voices bring the sensuous touch of the siren. I love this album and can hardly stay still at the computer. "Down, dancer, down!" This Drummer's delight is the solo debut of hand percussionist JimMcGrath, who's work can be heard on TV, film scores and recordings like Music from the Television Series Northern Exposure (MCA) and Brent Lewis' The Primitive Truth. If you think percussion and envision a frenzied pseudo- shaman hammering away at an oversized drum, your in for a fine suprise. McGrath's approach is more subtle, involving an exotic array of instruments that are artfully manipulated in order to create aclean, crisp harmonic, suitable for moving, meditation, devotional dance, or just plain enjoyment. The drums do not demand attention,they invite one to immerse oneself into a warm cocoon of irresistible rhythms. Four fifteen minute sounding circles offer a wealth of unique moods and inspirations. African Talking drums, Mid-Eastern doumbecs, congas, bongos, water drum, rainsticks and an assortment of bells, shakers, and chimes, plus whispering / sighing / toning female voices create a mystical environment for the mind, body, and soul to explore. While the voices provide a center of focus, there are no lyrics to distract from the overall eperience. McGrath uses percussion as an integral part of healing and meditation seminars, and brings his drumming to the schools of California as part of the Drums and Rhythms Of The World Show. Not since Brent Lewis burst on to the scene a few years back has there been such an exciting new percussionist as Jim McGrath. Like Lewis (on whose last album he appeared) McGrath creates dynamic drum music that is consistently enlivening and just plain old good fun! On Percussive Environments, McGrath plays all the instruments himself, creating a veritable percussion orchestra. We hear the resonant pit-a-patter of congas, the sharp attack of bongos, the distinctive swooping sounds of the African talking drum,the dry crispness of a doumbec and the liquid modulations of a water drum, along with various rattles, shakers, and hand bells. Each of the four fifteen- minute tracks has it's own character. "Liquid Calm" is a sensuous introduction, featuring the breathy vocalizations of guest singers Donnette and Meg Thayer. "Onitima" has a tribal feel, with the two vocalists chanting the title phrase over pulsing hand drums. "Wounded" feature the strange rubbing and squeeking noises emitted by the Brazillian cuica. Sounding at times like a gurgling infant or a babbling extraterrestial, while "Running" sprints along at a furious pace, with gongs clanging over urgent hand drums. "Percussive Environments" is a stimulating and thoroughly enjoyable testimonial to the power of the drum. This drum album really inspires me to get up and dance to its primal rhythms. Some of the rhythms are repeated for sustained periods of time, and there is enough variety of percussive and vocal effects to maintain the listener's interest. "Liquid Calm" begins at a slow steady pace of different pitched drums accompanied by a delightful dreamy "aah" chant, then accelerates to a frenzied climax of rhythm with the addition of sighs and whispers (perhaps a dancer). It then returns to a calmer rhythm and long sighs. "Onitima" begins with a moderate rhythm of several drums. A chant of female voices enhances the rhythm. Unusual sound effects enhance "Wounded". It includes cries of a hurt being (animal/person?) or perhaps these cries represent an emotional, inner wounding. "Running" features an interweaving of different rapid rhythms, building to a very fast tempo. Overall, this is an excellent and interesting assortment of evocative rhythms and creative percussive effects for dance or guided visualization. This album in vigorates as well as relaxes. If categorized, it would be somewhere between World Beat and New Age. An assortment of exotic as well as standard percussion instruments, make up the four compositions, two of which also include female voice. It compels one to to ascend to a meditative state that is ideal to dancing to or just leisuring to. Opening with "Liquid Calm", one is almost insantly soothed by the flowing, moderate rhythm. You can imagine bathing in a remote waterfall in an exotic rainforest, or sitting beside a quiet stream. You are invited to visualize yourself in a Utopian environment. The association with moving water is inescapable, and the voices float above the instruments like mist above running water in the early morning. Very mollifying. The second selection fades in smoothly, and conjures images from the content of Africa. The voices call this one by name "Onitima." Bongos, shakers,triangle, what sounds like several congas, and a talking drum appear to make up the bulk of instruments in this one. Jim seems to have intentionally left room in the piece for improvisation of each instrument, so that the emotional impact on the listener would be tremendous. As "Wounded" introduces itself, you can almost picture a vast plain on which a predator, perhaps a cheetah, has wounded its prey. It sounds as if springs or mbiras are being utilized as well as a cuica for texture. This piece reminds me a little of an album Herbie Hancock put out a while back called "Sextant". As with each section, it is about 15 minutes long, but far from being monotonous, due to the variety of timbre used. Being the fastest selection in tempo, "Running" is aptly titled. The rhythm seems to lend itself into anticipating the next measure to follow. A great one for dancing. I really enjoyed this album. It's nice to hear compositions that strive to affect you on more of a spiritual level, instead of trying to stir up interest on a superficial level like many current alternative artists do. Good show Jim! mix of elements is very tribal and shamanic. Stewpots of water, mayonaise jars full of broken glass and dozens of rare percussion instruments from all over the world are the tools that Jim McGrath uses to sculpt his meditative, hypnotic compositions. McGrath has refined his unique and eclectic approach to percussion for over a decade in recording projects with artists ranging from Jack Waterson (Green on Red) to Steve Kilbey (The Church) and in live shows with various bands on both coasts. His own work Percussive Environments reflects his great respect for the purest nature of his instrument. 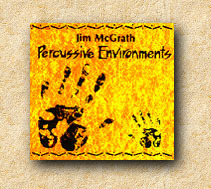 Instruments would be more accurate, and in his debut release McGrath includes 20 of his over 150 percussion instruments. These are played with a native empathy for rhythm that existed in human nature before it ever occured to anyone to make a drum. It is preciseley this experience when boundaries fade and the mind controlling the rhythm gives way to a rhythm with a mind completely of its own, that opens the way to another state of being. In this series of four compositions, each 15 minutes long, McGrath creates a subtle approach to rhythm that allows the sound to expand and change according to its own whims. Having experienced the hypnotic state that can be created in such a way first hand, McGrath recorded Percussive environments to inspire the listener to experience the same. "I wanted to achieve a primal natural sound, just out of respect for the drum itself." says McGrath " The effects used ondrums in the 80's have taken the sound of the drum to a far removed state of the natural one. There is nothing wrong with that, it's just not as beatiful as celebrating life by banging on a real drum and living in its natural resonance." McGrath's works in LA as a studio musician and also provides rhythm for dance and movement workshops as well as performing with a variety of local LA bands.